Of all the chicken nugget/strip subs. I found Morningstar Farms (MF) to be the best. 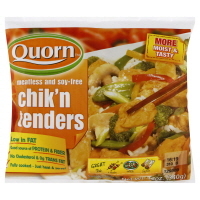 Quorn is pretty good while most are terrible but MF seems to get this product right. MF seems to be really hit or miss but they get the chicken stuff right. It may taste ok, but Quorn gives me the runs. I can't tolerate the mold it's made from.